Grout is that necessary element that holds your tiling and fixtures into place. It’s also one of the most renowned spots for collecting gross grime and weird things that can discolor it and make it look even dirtier than it might actually be. Cleaning grout is seldom easy, since it lies between the ceramic, stone, or glass it’s tasked with keeping steady. With that said, it’s existence is something that shouldn’t be ignored. With a few handy tips and tricks, you can keep your grout looking gorgeous. Can’t do it yourself, you may need to hire an apartment cleaning service. Make your job as easy as possible by surface-cleaning the area before you really start digging into the dirt. Use hot water and a stiff-bristled scrubbing brush to loosen surface dirt and debris. If you have a steam cleaner on hand, put it to work on your grout; the super hot temperatures and steam liquid will help prep your soon-to-be-bright grout. There are plenty of pricey products on the market that’ll promise you the world and more, but you don’t have to succumb to the expenses associated with brand-name items. Instead, mix up a DIY solution using a few items you probably already have in your home. 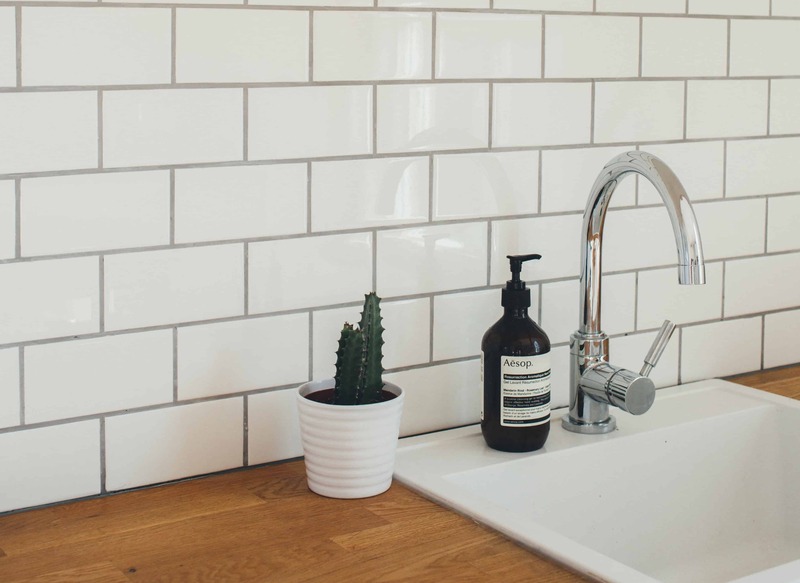 The tried-and-true combination of hydrogen peroxide and baking soda creates the perfect grout-cleaning solution. When coupled with a bit of laundry detergent, you’ll be able to cut through the grease and goo that gets tracked into your home. Mix the baking soda and hydrogen peroxide together first. Then, add the dish soap and continue mixing until it’s combined into a smooth ingredient. Spoon your mixture on the grout, wait 5 to 15 minutes, then scrub and rinse. Cleaning grout isn’t exactly a pleasant process (although people who love to clean often find it very therapeutic). The fact of the matter is that grout lives in places that require you to make your body a little uncomfortable. If you’re cleaning the grout on your kitchen or bathroom floors, you’ll be on your hands and knees for a while until you get it looking as white as you want it to be. If you’re scrubbing the walls of your shower, you’ll probably have to bend and stretch your body in ways that aren’t natural to your day-to-day life. Find ways to decrease the stress you’re putting on your body by wearing accessories such as knee pads to relieve excess pressure. Make sure you take breaks while you’re working, too. This will help your muscles come back to a relaxed state after they’ve stayed in a weird position for a while. By nature, grout is hard to reach, even when it’s out in the open. An arsenal of toothbrushes will be your best friend as you begin to tackle this task. They’re small enough to follow the lines of grout without overlooking the reason you’re doing this type of cleaning in the first place. Bear in mind that toothbrushes can get pretty gnarly fairly quickly, and you don’t want to swap one layer of dirt for another. For this reason, it’s important to have several toothbrushes available at your disposal when you’re ready to get down and dirty with your grout. If the bristles start to look haggard, you still have plenty of mileage left on them. Remember, you’re not brushing your teeth; you’re cleaning grout. If it starts to look like your toothbrushes are bringing more dirt with them than they’re eliminating, however, it’s time to switch to a new tool. You don’t have to go out and buy a bunch of new toothbrushes. Instead, keep the old toothbrushes your family swaps out when they get a new one. Those are perfectly fine for your flooring and bathroom tiles. You might not want to conquer your entire grout-cleaning task in a single mission, particularly if you have an expansive kitchen or bathroom. Rather than setting yourself up for a painfully long day of Cinderella-like cleaning duties, section off big areas so you only have to do a little at a time. If you start to get tired or simply have something to do that’s a little more fun, you can easily walk away and come back to the next section tomorrow. Painter’s tape is a great option that’ll help you create even sections without leaving sticky residue behind. Before you start scrubbing, create squares with painter’s tape so you’ll know where you left off if you need to finish your task on a different day. We said it above, but it’s worth repeating—make sure you leave your cleaning solution on the grout for 5 to 15 minutes. Grout is porous, meaning it absorbs a lot of the elements your tiles can ward away. It needs time to soak in your cleaning ingredients so the gross stuff that’s buried deep within the materials can benefit from the concoction you mixed together. You can always apply solution with a sponge. It’s a given that your grout is going to get a little gross from time to time. Because it’s the glue that holds all of your beautiful tile together, it’s subjected to a lot of wear and tear. Grout sealants fill the pores of grout, helping to keep out the grime and goo that causes it to get dingy in the first place. It’s important to ensure your grout is dry before you apply a sealer. Wait at least 24 hours after your cleaning project is complete to apply the sealer. If your grout’s getting the best of you, it’s time to call in the professionals. Companion Maids is an award-winning Chicago cleaning company that’ll clean your home as it’s our very own. Ready to get rid of the grime on your grout? We’re just a phone call or online contact form away!